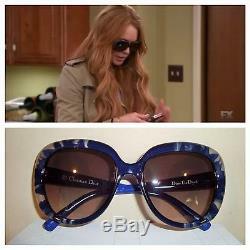 The sunglasses are designer sunglasses worn by Lohan in a scene with Charlie Sheen at his place. The glasses come with their original case and lens wipe. The set also comes with two packs of whiskey gum in which Lohan advertised for in a separate scene in the same episode. All this comes with an Official Studio Certificate of Authenticity from Lionsgate. These glasses are valuable sunglasses alone not even considering the fact they were worn by Lindsay Lohan on tv! Don't miss the chance to own and maybe even wear these sunglasses along with having some of these other cool items of Lohan's from her appearance on Anger Management on FX. The item "Lindsay Lohan Screen Used Worn Christian Dior Sunglasses Anger Management Set" is in sale since Sunday, April 3, 2016. This item is in the category "Entertainment Memorabilia\Television Memorabilia\Props\Originals". The seller is "thecloset2.0" and is located in Middleboro, Massachusetts. This item can be shipped to United States.